Japanese Knotweed is a highly invasive, fast-growing weed which can grow at speeds of 10cm a day. Its aggressive growing ability can lead to costly damage to property and infrastructure. How did Japanese Knotweed get to the UK? Japanese Knotweed (Fallopia japonica) is a native of Japan and was introduced during the Victorian period as an ornamental garden plant. Growing up to a metre a month, it quickly suffocates other vegetation and aggressively colonises any ground where it’s allowed to flourish. The non-native weed spreads rapidly, with its bamboo-like stems and large bright green leaves growing up to 2m, with a complex rhizome network underground, making this a hard species to remove yourself. Simply pulling the plant up yourself will not stop to spread, but can cause it to spread even faster. Japanese Knotweed can easily be confused with other, similar plants at first glance. Knotweed is very distinctive at each stage of its growth cycle. In early spring, red or purple shoots appear and grow into canes which sprout leaves that later unfurl and turn green. Japanese Knotweed is fully grown in the summer, the canes are matured and hollow and hold a distinctive purple speckle. They can grow up to three – four metres high. In late summer the Japanese Knotweed flowers creating clusters of small creamy-white flowers. 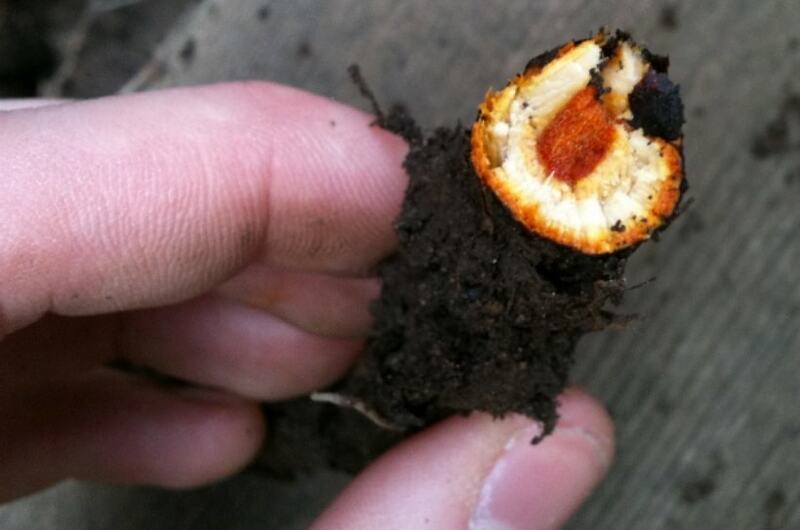 With each node having the potential to become a new plant when cut, for example by digging the Knotweed up. The problem with Japanese Knotweed is that it can sprout from as little as 2mm of rhizome, meaning it is classed as “controlled waste” under the Environmental Protection Act of 1990 and must only be disposed of into licensed landfill sites to stop further spread. Any attempts to remove Knotweed should therefore be carried out by licensed professionals. If any small portion of the plant is left in the soil, even a few inches, it can very quickly re-sprout. Only killing the entire underground root system will guarantee the eradication of the plant. Japanese Knotweed damage can be extensive. Knotweed’s strong, robust plant structure means it can thrive in a wide range of growing conditions. Soil pH or salinity has little impact on the growing rate of the plant, and it can survive temperatures as low as -35°C. This is how it is able to exploit gaps in concrete and brick, taking root and causing structural damage to driveways, roads, and property foundations. This can seriously affect the value of your home and influence your chances of getting a mortgage accepted. Its ability to grow up to 10cm a day during the summer mean it can quickly and easily overwhelm competitor plants and threaten properties by taking root within foundations. 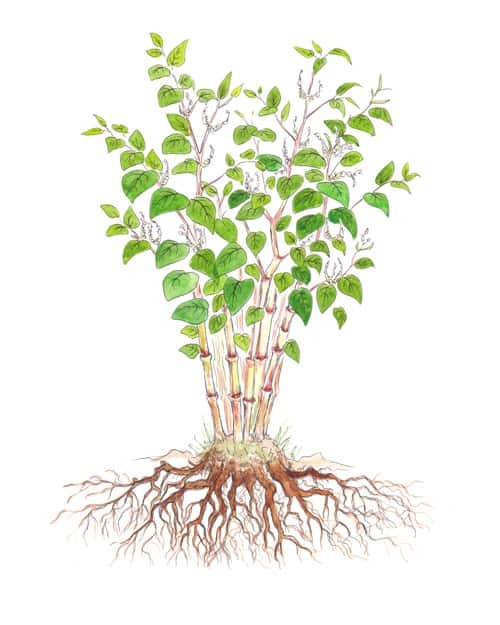 Japanese Knotweed root systems grow extensively, up to three metres deep and up to seven metres in all other directions. This makes removing the roots a difficult and labour-intensive task. As an invasive species with the ability to cause such damage, there is strict legislation in place around the disposal and control of Japanese Knotweed. It is not a legal requirement to report Japanese Knotweed, however if you are selling your home, it is a legal requirement to declare Japanese Knotweed within the TA6 form and if it is, you also need to provide a Japanese Knotweed management plan in order to satisfy mortgage lender requirements. Is it illegal to have Japanese Knotweed on my land? It is not illegal to have Japanese Knotweed growing on your land, however it is illegal to allow Japanese Knotweed to spread to a neighbouring property or adjoining land. Individuals with Japanese Knotweed on their premises have a legal responsibility to prevent the spread of the weed into neighbouring locations. Failure to stop the spread of Japanese Knotweed to neighbouring properties is an offence that can result in an Antisocial Behaviour Order (ASBO) and a fine of up to £2,500. If there is Japanese Knotweed in your neighbours garden or knotweed growth on adjoining land, you should speak directly with your neighbours or the landowners, as they could already be taking steps to prevent Japanese Knotweed spread. In the event of the homeowner or landowner failing to act, you can contact you local council. If you believe your property has Japanese Knotweed, it’s important to have a Japanese Knotweed survey in order to find out the extent of the problem and the best course of treatment for your property and future use of the land. There are various treatment and eradication methods available including herbicides from foliar sprays to stem injections, as well as physically excavating the Japanese Knotweed and disposing off-site. There are DIY Japanese Knotweed removal methods available, however it usually takes a number of years to fully eradicate, as well as there being strict laws of disposal of Japanese Knotweed. Japanese Knotweed can re-grow from cuttings as small as 2mm, meaning the smallest traces can lead to new growth. Because of this, Knotweed is classed as controlled waste and must be disposed of safely at a licensed landfill site according to the Environmental Protection Act (Duty of Care) Regulations 1991. Mortgage lenders often require a formal Japanese Knotweed management plan and Insurance Backed Guarantee from a professional contractor in order to satisfy mortgage requirements. Home removal methods will also mean that you do not have an Insurance Backed Guarantee, which can also be a requirement in order for buyers to obtain a mortgage for your property, or you will not be protected in the event of future regrowth. Think you may have Japanese Knotweed? Japanese knotweed is the UK’s fastest-growing invasive weed. If left untreated Japanese knotweed quickly exploit weaknesses in brick, tarmac, and metal piping, causing costly damage to everything from buildings to roads. Act quickly to identify if you have a Japanese Knotweed problem. We offer our 10 Year Insurance Backed Guarantee (10 Year IBG Policy) following remediation. This guarantee will cover your property against the regrowth of Japanese Knotweed after eradication. All of our treatment plans are tailor-made to suit each individual case.